FILE PHOTO: Rosa Ayala checks her ballot after voting in the U.S. presidential primary June 7, 2016 in Los Angeles. 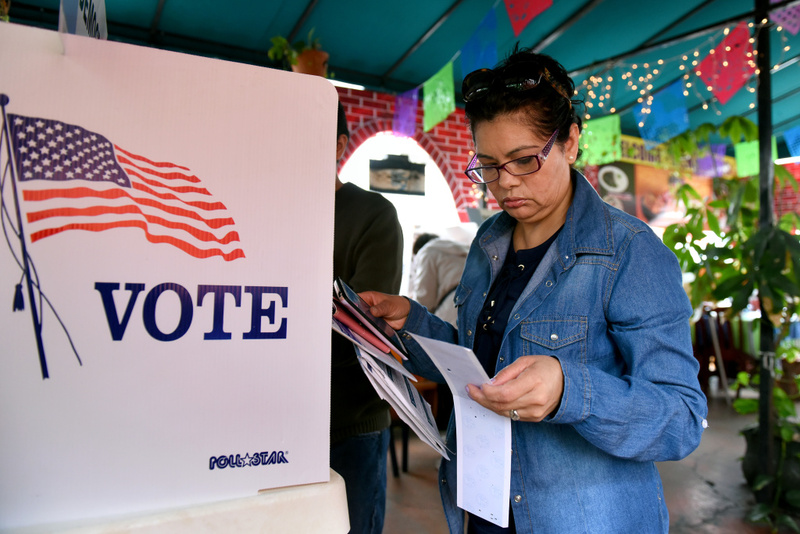 Voters will head to the polls on May 16 to decide two Los Angeles City Council seats, two Los Angeles Unified school board seats and one citywide ballot measure. Los Angeles city officials will hold the runoff elections on May 16 for two City Council seats and two school board seats. Plus, a city ballot measure will go before voters across Los Angeles. If you want to participate and are not already registered to vote, today is the deadline. We have more details below on how to register. To help you get ready for the upcoming local elections, we are back with the Human Voter Guide, our question-and-answer feature about California elections. The Human Voter Guide answers your voting questions on KPCC's Take Two and on the Human Voter Guide webpage. If you need an answer about voting or something on the ballot, call 323-538-5722 and leave a voice mail or send a text. You can also reach out via email: humanvoterguide@gmail.com. We're also taking questions and providing guidance for the upcoming 34th Congressional District runoff election scheduled for June 6. Q: May 16 is coming right up. What’s at stake in this election? Four key seats are at stake in this city runoff and one citywide ballot measure. City Council District 1: Candidates are incumbent Gil Cedillo and challenger Joe Bray-Ali. The district seat covers communities that include MacArthur Park, Koreatown, Mt. Washington and Cypress Park. You can learn more about the candidates in KPCC's candidate survey. City Council District 7: Candidates are Monica Rodriguez and Karo Torossian. The district covers portions of northern Los Angeles, including Sunland, Lake View Terrace, Pacoima and Shadow Hills. You can learn more about the candidates KPCC's candidate survey. Los Angeles Unified School Board District 4: Candidates are incumbent Steve Zimmer and challenger Nick Melvoin. The district includes Venice, Marina del Rey, Pacific Palisades, Brentwood, Hollywood, portions of Encino, Tarzana and other neighborhoods in the southwest San Fernando Valley. You can learn more about the candidates in KPCC's candidate survey. Los Angeles Unified School Board District 6: Candidates are Imelda Padilla and Kelly Gonez. The seat covers East San Fernando Valley neighborhoods east of the 405 Freeway, including Sunland-Tujunga and Lakeview Terrace; and some areas west of the 405, such as Lake Balboa. You can learn more about the candidates in KPCC's candidate survey. City Charter Amendment C: A proposed change to the City Charter that would allow the City Council to provide a police officer with the option to select an all-civilian board to hear his or her disciplinary matter. KPCC's previous coverage of this issue can be found here and here. We have more information on the measure below. Q: Who votes in these elections? Residents who live within the boundaries of the districts mentioned above are eligible to vote in those races. To look up what races will be on your ballot, check the county's website. In addition, all registered voters in Los Angeles can vote on the ballot measure that deals with police discipline. In sum: unless you live in one of the two City Council districts voting on its council member, you will have just one item on your ballot. Q: Tell me more about the ballot — what will it do if voters vote "yes"? If voters approve it, Measure C will allow police officers who are going through discipline procedures to select an all-civilian review panel. These panels are charged with determining whether LAPD officers have committed serious misconduct; they often decide whether to fire officers or discipline them in some other way. Currently, the panels are made up of two LAPD command staffers and one civilian. Measure C would give the option to change that to an all-civilian panel. KPCC will have more reporting on Measure C available in the coming weeks. Another good source for researching the ballot measure is to read the pro and con arguments in your sample ballot. You can also check out the Los Angeles Times' editorial board endorsement. Q: We talk a lot about how voter turnout in these off-year elections is so low. Why have an election with just one thing on the ballot for many voters? Isn’t that expensive? Yes, it is. The L.A. City Clerk has budgeted about $6 million for the election. As a point of reference, the past few general municipal elections have cost between $4.7 million and $9 million. Ultimately the L.A. City Council is responsible for the timing of elections. They voted in January to put Measure C on the ballot. At that point, they’d missed the deadline to get it in front of voters during an earlier election. Q: Any voting deadlines people should be aware of? Today is the last day to register to vote. The fastest way to register is online, and you have until midnight to do it. This is also important to do if you’ve moved recently. You can update your registration via the same website. Q: The city is running this election, not the county. How does that change things? The process for voting will be the same. The city rents the voting machines from the county so if you’re voting in person, the mechanics will work the same way. Many of the same polling locations will be used as well, but those can always change. Check your sample ballot for your polling location or do so online. • You can’t request a vote by mail ballot online. You have to do it via mail or by fax. Return it via mail to: Office of the City Clerk - Election Division, 555 Ramirez St., Space 300, Los Angeles, CA 90012. Alternatively, voters can fax in their requests to 213-978-0611 or 213-978-0612. All vote by mail applications must arrive to election officials by May 9 at 5 p.m.
• You don't need to use a stamp on your envelope. Unlike the county, the city prepays the postage on your vote by mail ballot. This is a program that was started a couple of years ago to help increase participation. Municipal elections will be held through 2017. To help you navigate the way, we revive KPCC's Human Voter Guide, a series of questions-and-answers about California elections. Have a question? Email our senior political reporter Mary Plummer, tweet her @maryplummer or leave a voice mail or text at 323-538-5722.